Home » OmniRunning Blog » Promoting A Race? Are you promoting a race? I get emails every day promoting races of all distances from all over the place. Some of them are very slick and corporate looking. Nothing wrong with that. But these sharp folks don’t seem to understand how runners decide which races to run. Like most of you I get a deluge of email every day. I have six email accounts and they all get all kinds of email. Most of it is of no interest to me. As you can imagine I get overloaded after looking through one or two of my email accounts. Before long, I’m slashing and burning emails like I’m hacking my way through a junk mail jungle. It get’s to the point where I read the subject line and maybe some text just before I hit delete. It’s amazing how quickly you can get through hundreds of emails with only a cursory look. I trust that I am not alone bushwhacking my way through the jungle of junk email. And I know that any email marketer worth their salt knows all of us have had it with poorly written junk. That is why I am constantly amazed to get emails about races with the location, date and time buried in the text or not even in the email. You want me to click a link to find out when your race is? I’m more likely to hit “delete” and be off to the next ill conceived interruption of my day. So when I get a well constructed email I like to take note. It’s like a breath of fresh air. Someone actually took the time to think how I or any runner would receive their plea to register for their race. Today I received an email for The Wilmington Half Marathon & 5K. I did a snippy-clippy from their email to show you how it should be done. The subject like tells me exactly what race this is and when. I can make a quick decision just with that info. Beautiful! Do I want to drive to Wilmington and am I free on September 23rd. Pretty easy to figure out. I did have to click to down load their graphic but that’s pretty standard these days. With a quick roll of the mouse button I know the time and location of the race. I’m also enticed to “Register Early” as there may be a discount but only if I click through. A very nice and subtle call to action! To further pique my interest at the bottom they say the first 500 runners get a draw string bag. Now who doesn’t have a closet full of these bags and who doesn’t always want more free stuff? I with I could write succinct emails and even blog posts. One of the great things about the Wilmington Half Marathon is that they’ve done this 13 times already. They made all of the classic mistakes years ago. They know what they are doing. You can be reasonably assured that the race will be well managed and that they will keep an eye on traffic for you. Wilmington has kept this a budget race over the years, I know a lot of people like the pomp and circumstance of a big production race, but all half marathons are the same distance no matter how flashy they are. 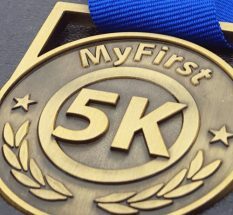 Wilmington will cost you $35 for The Half and $25 for the 5K. Add $5 for race day registrations. Students 18 and under pay $15.00. There are few bargains still available and this is one of them. Their email tells you they are well organized and know their business. I’ve run this race before and can tell you that if you enjoy a low key, low budget event then you’re going like like this half. Check them out. If you can make it I’m sure you’ll enjoy this race. And if you write promotional materials and emails, don’t get lost in the weeds. Just the facts will do.